Centerra Gold Inc. (TSX: CG) announced today that it exceeded its 2015 annual production guidance and that consolidated gold production for 2015 totalled 536,921 ounces. This production total includes 520,695 ounces of gold from the Kumtor mine, located in the Kyrgyz Republic and 16,226 ounces of gold from the Boroo mine, located in Mongolia. During the fourth quarter of 2015, consolidated gold production was 133,665 ounces, including 130,611 ounces of gold produced by the Kumtor mine and 3,054 ounces of gold produced by the Boroo mine. “We are continuing to advance the Öksüt Project in Turkey. Work on the detailed engineering and procurement of contractors and equipment is ongoing. Our site project management team is now in place and will be moving to our offices in Develi, which is approximately 20 minutes from the site, on February 1st,” he concluded. The Company also notes that, effective January 1, 2016, Ian Atkinson formally stepped down from the Board of Directors and that Scott Perry has been appointed to the Board of Directors. Kumtor’s forecast 2016 production and unit costs are provided on a 100% basis. See “Material Assumption and Risks” for other material assumptions or factors used to forecast production and costs for 2016. 2016 production is expected to come from the Kumtor mine and is consistent with the 2016 production outlined in the life-of-mine plan set out in the Kumtor NI 43-101 technical report dated March 20, 2015, filed on SEDAR. The Boroo mine will continue with closure activities mainly focusing on reclamation work at the Boroo property. Any revenue from Boroo gold production from rinsing the heap leach pad will be offset against mine closure costs. The 2016 production forecast assumes no gold production from Boroo or Gatsuurt. (1) Adjusted operating costs per ounce sold, all-in sustaining costs per ounce sold, all-in costs (excluding growth projects) per ounce sold, all-in costs (excluding growth projects and including taxes) per ounce sold, as well as capital expenditures (sustaining and growth) are non-GAAP measures and are discussed under “Non-GAAP Measures” in the Company’s Management Discussion and Analysis (MDA) filed on SEDAR. (2) Boroo costs include maintaining the Boroo mill on care and maintenance and ongoing closure costs net of gold sales. (3) Other costs per ounce sold include global exploration expenses, business development expense and project development costs not related to current operations. (4) Includes revenue-based tax that reflects a forecast gold price assumption of $1,125 per ounce sold. Planned exploration expenditures for 2016 total $11 million, which is approximately equal to the 2015 exploration spending. The 2016 exploration plan includes $1.0 million for further exploration work on the Öksüt property, and $10 million to fund other ongoing projects (excluding Greenstone) and generative exploration programs. See also 2016 Greenstone Property. Centerra’s projected capital expenditures for 2016, excluding capitalized stripping, are estimated to be $269 million, including $85 million of sustaining capital1 and $184 million of growth capital1. At Kumtor, 2016 total capital expenditures, excluding capitalized stripping, are forecast to be $110 million. Spending on sustaining capital1 of $84 million relates primarily to major overhauls and replacements of the heavy duty mine equipment ($69 million), construction to raise the tailings dam ($6 million) and other items ($9 million). Growth capital1 investment at Kumtor for 2016 is forecast at $26 million and includes the relocation of certain infrastructure at Kumtor related to the KS-13 life-of-mine expansion plan amounting to $17 million, dewatering projects ($6 million) and other items ($3 million). The cash component of capitalized stripping costs related to the development of the open pit is expected to be $122 million of the $162 million total capitalized stripping in 2016. At Boroo, 2016 sustaining capital1 expenditures are expected to be minimal and no growth capital1 is forecast for Boroo or Gatsuurt. This will be re-assessed subject to approval of the Gatsuurt Project by the Mongolian Parliament. The Company expects to spend $157 million for capital construction at the Öksüt property in 2016. The total planned spending of $157 million includes mine construction costs of $134 million, capitalized project support and administration costs of $19 million, and other capitalized costs of $4 million. Centerra acquired a 50% interest in the Greenstone Gold Property from Premier Gold on March 9, 2015, resulting in the formation of a 50/50 partnership (Greenstone Gold Mines L.P.). Centerra has agreed to fund exploration work and project development work including completion of the feasibility study (via capital contributions) to the Greenstone Partnership in the aggregate amount of C$185 million, which obligation is subject to certain feasibility study results and project advancement criteria. The joint venture expects to complete the feasibility study for the Hardrock Project by the middle of 2016. Centerra’s guidance for 2016 expenditures in connection with the Greenstone Gold Property is approximately $10.8 million (C$14.5 million) and represents costs forecast to be spent to the completion of the feasibility study. At that time, Centerra will re-estimate costs for the balance of the year. The 2016 guidance includes work for technical studies, environmental and social impact assessment, project support ($7.6 million), exploration ($2.2 million) as well as some capital expenditures for the project ($1 million). The forecast spending for 2016 will be fully funded by Centerra with 50% of spending accounted for as pre-development project spending or exploration and expensed through Centerra’s income statement. The remaining 50% of spending will be capitalized on Centerra’s balance sheet and be accounted for as an acquisition cost of the Greenstone Gold Property ($4.9 million) in addition to $1 million to be spent on capital items. Corporate and administration expense for 2016 is forecast to be $31 million, which includes $30 million for corporate and administration costs, and $1 million for business development activities. 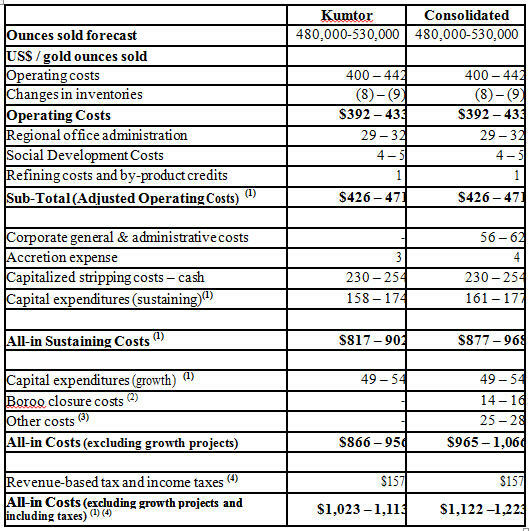 Consolidated depreciation, depletion and amortization expense included in costs of sales expense for 2016 is forecasted to be approximately $206 million at Kumtor. Pursuant to the Restated Investment Agreement, Kumtor’s operations are not subject to corporate income taxes. The agreement assesses tax at 13% on gross revenue (plus 1% for the Issyk-Kul Oblast Development Fund). Centerra’s revenues, earnings and cash flows for 2016 are sensitive to changes in certain key inputs or currencies. The Company has estimated the impact of any such changes on revenues, net earnings and cash from operations. The assumed diesel price of $0.55/litre at Kumtor assumes that no Russian export duty will be paid on the fuel exports from Russia to the Kyrgyz Republic. Diesel fuel is sourced from separate Russian suppliers for both sites and only loosely correlates with world oil prices. The diesel fuel price assumptions were made when the price of oil was approximately $50 per barrel. That any discussions between the Government of the Kyrgyz Republic and Centerra regarding the resolution of all outstanding matters affecting the Kumtor mine are satisfactory to Centerra, fair to all of Centerra’s shareholders, and that any such resolution will receive all necessary legal and regulatory approvals under Kyrgyz law and/or Canadian law. All mine plans and related permits and authorizations at Kumtor receive timely approval from all relevant governmental agencies. The pit walls at Kumtor remain stable. The new resource block model for the Kumtor central pit reconciles as expected against production. Any actions taken by the Kyrgyz Republic Parliament and Government do not have a material impact on operations or financial results. This includes any action being taken by the Parliament or Government to cancel the Kumtor Project Agreements, or taking any actions which are not consistent with the rights of Centerra and Kumtor Gold Company (KGC) under the Kumtor Project Agreements. The previously disclosed environmental claims received from the Kyrgyz regulatory authorities in the aggregate amount of approximately $476 million (at the then current exchange rates) and the claims of the Kyrgyz Republic’s General Prosecutor’s Office purporting to invalidate land use rights and/or seize land at Kumtor and to unwind the $200 million inter-company dividend declared and paid by KGC to Centerra in December 2013, and any further claims, whether environmental allegations or otherwise, are resolved without material impact on Centerra’s operations or financial results. The accession of the Kyrgyz Republic into the Eurasian Economic Union and/or any sanctions imposed on Russian entities do not have a negative effect on the costs or availability of inputs or equipment to the Kumtor Project. The movement in the Central Valley Waste Dump at Kumtor, referred to in the 2014 Annual Information Form, does not accelerate and will be managed to ensure continued safe operations, without impact to gold production. Grades and recoveries at Kumtor will remain consistent with the 2016 production plan to achieve the forecast gold production. The Kumtor mill continues to operate as expected. Prices of key consumables, costs of power and water usage fees are not significantly higher than prices assumed in planning. No unplanned delays in or interruption of scheduled production from our mines, including due to civil unrest, natural phenomena, regulatory or political disputes, equipment breakdown or other developmental and operational risks. Production, cost and capital forecasts for 2016 are forward-looking information and are based on key assumptions and subject to material risk factors that could cause actual results to differ materially and which are discussed herein under the headings “Material Assumptions & Risks” and “Cautionary Note Regarding Forward-Looking Information” in this news release and under the heading “Risk Factors” in the Company’s 2014 MD&A and in the Company’s Annual Information Form for the year ended December 31, 2014. The scientific and technical information in this news release, including the production estimates were prepared in accordance with the standards of the Canadian Institute of Mining, Metallurgy and Petroleum and National Instrument 43-101 and were prepared, reviewed, verified and compiled by Centerra’s technical staff under the supervision of Gordon Reid, Professional Engineer and Centerra’s Vice-President and Chief Operating Officer, who is the qualified person for the purpose of NI 43-101. Information contained in this news release which are not statements of historical facts, and the documents incorporated by reference herein, may be “forward-looking information” for the purposes of Canadian securities laws. Such forward-looking information involves risks, uncertainties and other factors that could cause actual results, performance, prospects and opportunities to differ materially from those expressed or implied by such forward looking information. The words “believe”, “expect”, “anticipate”, “contemplate”, “target”, “plan”, “intends”, “continue”, “budget”, “estimate”, “may”, “will”, “schedule” and similar expressions identify forward- looking information. These forward-looking statements relate to, among other things, the statements made under the heading, “2016 Outlook”; the Company’s expectations regarding future production, all-in sustaining costs per ounce sold1, all-in costs (excluding growth projects) per ounce sold1 and all-in costs (excluding growth projects and including taxes) per ounce sold1, 2016 exploration expenditures; 2016 capital expenditures; 2016 corporate administration and community investment expenses; 2016 depreciation, depletion and amortization expenses; and 2016 tax expenses. Forward-looking information is necessarily based upon a number of estimates and assumptions that, while considered reasonable by Centerra, are inherently subject to significant political, business, economic and competitive uncertainties and contingencies. Known and unknown factors could cause actual results to differ materially from those projected in the forward looking information. Factors that could cause actual results or events to differ materially from current expectations include, among other things: (A) strategic, legal, planning and other risks, including: political risks associated with the Company’s operations in the Kyrgyz Republic, Mongolia and Turkey; resource nationalism including the management of external stakeholder expectations; the impact of changes in, or to the more aggressive enforcement of, laws, regulations and government practices in the jurisdictions in which the Company operates including any unjustified civil or criminal action against the Company, its affiliates or its current or former employees; the impact of any actions taken by the Kyrgyz Republic Government and Parliament relating to the Kumtor Project Agreements which are inconsistent with the rights of Centerra and KGC under the Kumtor Project Agreements; any impact on the purported cancellation of Kumtor’s land use rights at the Kumtor Project pursuant to a court claim commenced by the Kyrgyz Republic GPO; the risks related to other outstanding litigation affecting the Company’s operations in the Kyrgyz Republic and elsewhere; the impact of the delay by relevant government agencies to provide required approvals and permits, including the delay currently being experienced at the Kumtor Project over the Kumtor 2015 life of mine plan and ecological passport; the impact of changes to, the increased enforcement of, environmental laws and regulations relating to the Company’s operations; the impact of any sanctions imposed by Canada, the United States or other jurisdictions against various Russian individuals and entities; potential defects of title in the Company’s properties that are not known as of the date hereof; the inability of the Company and its subsidiaries to enforce their legal rights in certain circumstances; the presence of a significant shareholder that is a state-owned company of the Kyrgyz Republic; risks related to anti-corruption legislation; risks related to the concentration of assets in Central Asia; and aboriginal claims and consultative issues relating to the Company’s 50% interest in the Greenstone Gold Property; potential risks related to kidnapping or acts of terrorism; (B) risks relating to financial matters, including: sensitivity of the Company’s business to the volatility of gold prices, the imprecision of the Company’s mineral reserves and resources estimates and the assumptions they rely on, the accuracy of the Company’s production and cost estimates, the impact of restrictive covenants in the Company’s revolving credit facility which may, among other things, restrict the Company from pursuing certain business activities, the Company’s ability to obtain future financing, the impact of global financial conditions, the impact of currency fluctuations, the effect of market conditions on the Company’s short-term investments, the Company’s ability to make payments including any payments of principal and interest on the Company’s debt facilities depends on the cash flow of its subsidiaries; and (C) risks related to operational matters and geotechnical issues, including: movement of the Davidov Glacier and the waste and ice movement at the Kumtor Project and the Company’s continued ability to successfully manage such matters, including the continued performance of the buttress; the occurrence of further ground movements at the Kumtor Project and mechanical availability; the success of the Company’s future exploration and development activities, including the financial and political risks inherent in carrying out exploration activities; inherent risks associated with the use of sodium cyanide in the mining operations; the adequacy of the Company’s insurance to mitigate operational risks; mechanical breakdowns; the Company’s ability to obtain the necessary permits and authorizations to (among other things) raise the tailings dam at the Kumtor Project to the required height; the Company’s ability to replace its mineral reserves; the occurrence of any labour unrest or disturbance and the ability of the Company to successfully re-negotiate collective agreements when required; the risk that Centerra’s workforce may be exposed to widespread epidemic; seismic activity in the vicinity of the Company’s operations in the Kyrgyz Republic and Mongolia; long lead times required for equipment and supplies given the remote location of some of the Company’s operating properties; reliance on a limited number of suppliers for certain consumables, equipment and components; illegal mining on the Company’s Mongolian properties; the Company’s ability to accurately predict decommissioning and reclamation costs; the Company’s ability to attract and retain qualified personnel; and risks associated with the conduct of joint ventures/partnerships, including the Greenstone Gold Partnership; the Company’s ability to manage its projects effectively and to mitigate the potential lack of availability of contractors, budget and timing overruns and project resources. See “Risk Factors” in the Company’s 2014 Annual Information Form available on SEDAR at www.sedar.com. There can be no assurances that forward-looking information and statements will prove to be accurate, as many factors and future events, both known and unknown could cause actual results, performance or achievements to vary or differ materially, from the results, performance or achievements that are or may be expressed or implied by such forward-looking statements contained herein or incorporated by reference. Accordingly, all such factors should be considered carefully when making decisions with respect to Centerra, and prospective investors should not place undue reliance on forward looking information. Forward-looking information is as of January 11, 2016. Centerra assumes no obligation to update or revise forward looking information to reflect changes in assumptions, changes in circumstances or any other events affecting such forward-looking information, except as required by applicable law. Centerra Gold Inc. is a Canadian-based gold mining company focused on operating, developing, exploring and acquiring gold properties in Asia, North America and other markets worldwide. Centerra is the largest Western- based gold producer in Central Asia. Centerra’s shares trade on the Toronto Stock Exchange (TSX) under the symbol CG. The Company is based in Toronto, Ontario, Canada. 1 Non-GAAP measure, see discussion under “Non-GAAP Measures” in the Company’s MDA filed on SEDAR.